As Allstate and Nationwide roll out large mobile hail dent estimating systems able to scan an entire vehicle inside, another company is trying to do the same job with just a smartphone. Cass said that the technology can handle an entire area like a panel — an insurer or customer wouldn’t have to take individual photos of each dent, just a few wider shots of the car. There’s also an opportunity for manual dent entry in case the computer misses one. 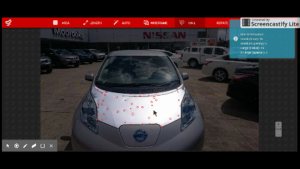 OnSource Smart Picture Dent Detection Demo – Vimeo from OnSource on Vimeo. The flipside of the technology would be if an “inspector” (OnSource staffers who take the images and send them to the actual licensed adjusters) or customer misses dents by failing to photograph a particular panel or add undetected dents manually. This could lead to frustrating arguments with a body shop or paintless dent repairer — particularly if a deskbound adjuster hasn’t actually seen the vehicle and relies purely on customer-submitted photos. Nationwide and Allstate, in contrast, have adjusters manning their hail-detecting trailers. Those wanting to learn more about estimating and repair planning should attend “The Myths, Mysteries and Fallacies Surrounding Accurate Repair Planning” with Bob Gilbert, AkzoNobel. The presentation will be at this year’s SEMA Show as part of the Society of Collision Repair Specialists’ Repairer Driven Education series. Register here. The technology works by finding scale and geometric information from a calibration tool which can be emailed or texted, similar to the way a ruler is placed in a scientific or evidentiary photo for scale. For more details, attend the “Automated Dent Detection, Right From Your Phone” webinar with Myllykoski and Schneider on Sept. 30 at 1 p.m. ET.